You probably know by now that one of the chief benefits of bringing AV devices onto the network is the data and analytics you can glean from them—and that when it comes to streamlining your real estate costs, this data can be invaluable. Knowing precisely how your space and the technology within it are used offers the potential for tremendous cost savings. But where do you start? 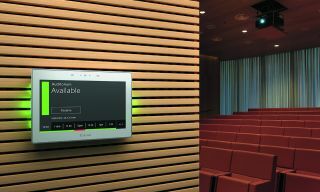 Extron TouchLink Scheduling panels display room availability and schedules, while providing the information needed to closely analyze room usage, activity patterns, and occupancy trends across the organization. In addition, Extron GVE (GlobalViewerEnterprise) software gives users the ability to manage AV devices across an organization. “Every Extron product generates a lot of date and the reporting tools inside of GVE allow informed decisions about inventory and maintenance plans,” da Silva continued. “Tech support personnel can view live information about the devices installed in every space. GVE allows organizations to identify usage trends, maximize system uptime, calculate energy usage, and maintain inventory lists for all spaces. Technicians may also manage their GVE environment by using the iGVE mobile App, available for the Apple iPad, iPhone, and iPod touch devices. As an industry leader, Crestron has been providing businesses with data analytics tools for more than a decade, according to Nic Milani, the company’s executive director of commercial product marketing. Its web-based tools like Crestron Fusion and XiO Cloud are designed to collect data and generate reports to help organizations optimize investments in people, spaces, and technology. Better utilization of space, more productivity, and less frustration. That’s a win-win-win.